Sneakers? Trainers? Call them whatever you wish: the point is I LOVE them. 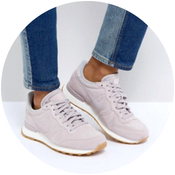 Some may say a whole post about sneakers is slightly excessive, but I disagree and would like to share some of my favourite pairs from the latest trends being stocked on ASOS. I've been seeing so many colourful trainers recently, particularly pastel ones. They first caught my eye when the Converse One Stars got released (which for some reason I haven't seen many people wear, but I'm definitely a fan). They add a pop of colour to an outfit and make it that little bit more exciting. If you're more of a fan of the sporty look, then Reebok do their classic pair in a gorgeous mint shade. My favourite is probably the white Aldo sneakers with a contract colour block sole - definitely more out there, but I just think they're so fun and different! Two out of the three pastel sneakers in the first collage are actually suede and that's because suede sneakers are EVERYWHERE at the moment. I haven't got myself a pair yet considering how much it rains here in the UK; they probably won't make the most practical everyday pair. I have definitely been eyeing up a few though including these pink Ted Baker ones which are so incredibly cute! Nike does a similar version of the Reebok trainers in the first collage which I also love. Anddd, of course, I had to feature a pair of Puma Suedes because everyone seems to be obsessed at the moment! Fila has suddenly come back out of nowhere and the 2 most popular trainers seem to be the Fila Orbit trainers in patent black and the Fila Disruptor II's. Yep, that's right... chunky trainers are back in style. Personally, I'm a fan, but for most people, they seem to be a love or hate thing. If the Fila Disruptors are a bit much for you, then have a look at the slightly more understated Nike Air Max 97 trainers. When I first saw that Vans did a platform version of their classic, Old Skool sneakers, I must admit, I really was not a fan. They have grown on me though and I quite like that they add a bit to your height for only £5 more! Puma also offers some really nice platform sneakers and there's the platform Converse All Stars... I am definitely not cool enough for them, but I bet some people could totally rock them! Thank you to ASOS for letting us use their images!